When the time comes to buying a new front door, you are inevitably met with a lot more choices than you were ever expecting. From colours to styles the options are literally vast; however add material into this equation and most of potential door buyers get really confused. It is normally pretty easy to decide on the colour or style; as these more often than not come down to a matter of personal preference. Material on the other hand is more of a considered option due to the multiple factors associated. Price, heat retention, style, size, durability & security all need to be taken into account. Most composite doors have a GRP (glass reinforced plastic) skin, which as it sounds makes the outside of the door extremely durable. This GRP skin subsequently results in the colour of your new door staying that colour for a long time. UPVC alternatives are renowned for their ability to discolour over time, whilst wood requires a great deal of love and attention in order to maintain that bespoke paint job. I know what you are thinking “those timber effects just look like plastic with some fake wood grain etched” – which would have been the case three years ago. Since then, big strides have been made in the manufacturing processes meaning that the timber effect really does pass as timber. This results in all the aesthetics of a wood door, without any of the maintenance and security issues. A gasket is the part of the frame with which when the door is shut forms an air tight seal. Unfortunately wooden doors rarely have a gasket whilst UPVC doors are known for having large visible gaskets that more often than not take away from the design of the door. 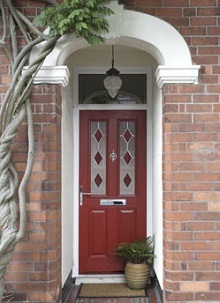 Composite doors almost always have a hidden gasket, meaning most eyes focus on the design rather than the visible seal. Composite doors due to the manufacturing techniques and components employed are extremely resilient. In the UK the majority of composite doors made adhere to the strict ‘secured by design’ police initiative for safer homes. It is this level of security which is often recognised by insurance companies and often leads to home insurance premiums being reduced post installation. U values are a measure of the amount of heat lost through a surface, the lower the U value rating the better. Composite doors are the only type of doors which at present conform to the European Union’s maximum U value rating of 1.8W/m2K. This means that not only will installing a composite door save you money on heating/cooling, but it will also reduce your carbon footprint. The above composite door information is provided by Yale composite doors. Each one of Yale’s exterior doors for home meets the strict ‘secured by design’ requirements as well as achieving U values of down to 1.0W/(m2.K)!